Gulliver's Travels is a British/American TV miniseries based on Jonathan Swift's novel of the same name, produced by Jim Henson Productions and Hallmark Entertainment. This miniseries is notable for being one of the very few adaptations of Swift's novel to feature all four voyages. The miniseries aired in the United Kingdom on Channel 4, and in the United States on NBC in February 1996. The miniseries stars Ted Danson, Mary Steenburgen, Peter O'Toole, John Gielgud, Omar Sharif, Isabelle Huppert, Geraldine Chaplin, Shashi Kapoor, Warwick Davis, Kristin Scott Thomas, Alfre Woodard, Kate Maberly, Tom Sturridge, Richard Wilson and Nicholas Lyndhurst. The series won five Emmy Awards including in the Outstanding Miniseries category. In this version, Dr. Gulliver has returned to his family after a long absence. The action shifts back and forth between flashbacks of his travels and the present where he is telling the story of his travels and has been committed to an insane asylum (the flashback framework and the incarceration in the asylum are not in the novel). While the miniseries remains faithful to the novel, the ending has been changed to have a more upbeat conclusion. In the book, Gulliver is so impressed with the Utopian country of the Houyhnhnms that when he returns to England he eventually chooses to live out his life among the horses in his barn, rather than with his family. In the miniseries, he recovers from this obsession and returns to his wife and child. It took years to find the financial backing for the miniseries. The project required a good deal of Special Effects work. 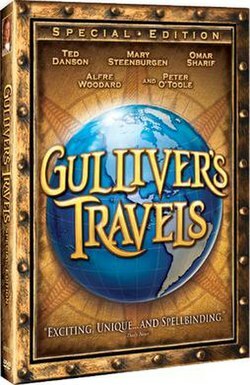 Producer Duncan Kenworthy said that, "It [Gulliver's Travels] was something I'd been developing while Jim was still alive. ... We wanted to do the whole book, and that was what interested Jim." Jim Henson's Creature Shop created several CGI wasps and some prosthetic make-up for the Yahoos. The animals seen in this film were provided by A1 Animals. It was shot in England and Portugal. The story begins on the night that Lemuel Gulliver (Ted Danson) arrives back at home. Gulliver imagines for a moment that he is back on the shipwreck that started his travels. Meanwhile, Gulliver is found by his wife Mary (Mary Steenburgen) and son Tom (Tom Sturridge) in the horse stable the next day. He then proceeds to tell his story (which is narrated in flashbacks as Gulliver begins telling his tale) starting back to the day of the shipwreck and the famous arrival of Gulliver to Lilliput, an island consisting of tiny people. Gulliver continues to explain the strange customs of Lilliput, such as the naming of officials by doing rituals such as the jumping over and going under a stick held by the Emperor of Lilliput (Peter O'Toole). Gulliver is then presented to the Empress of Lilliput (Phoebe Nicholls) and is asked to fight a war against the enemy country of Blefuscu. Gulliver then accepts and wins the war in order to show gratitude towards the Lilliputians. After some time, they ask him to eliminate Blefuscu further which Gulliver refuses. A fire occurs at the palace which Gulliver puts out with his urine enough to end up soaking the trapped Empress. The Empress demands that her husband have Gulliver executed. After fleeing from the Emperor's army, Gulliver ends up on the run. Gulliver's new Lilliputian friends help him by hiding him, reciprocating Gulliver's help towards them to obtain the highest office. He then flees from Lilliput and ends up in the sea after making a raft with thousands of trees to escape. Meanwhile, Gulliver's wife Mary asks for the help of Dr. Bates (James Fox), a member of the mental institution in London who appears to help Gulliver, but is actually plotting how to get rid of him. He pretends to send Mary's letters to Gulliver in the institution, but actually intercepts them, saving them in a book shelf. Meanwhile, Gulliver is sent to a mental institution, and he is allowed to tell his tale to everyone present. He also appears to show signs of dementia, although these are just memories of his travels. Tom later discovers a small Lilliputian sheep (which he tries to retrieve towards the end of the series). Gulliver later lands in the land of Brobdingnag which consists of Giants. He is shown as an exhibition by Farmer Grultrud (Ned Beatty) and his daughter Glumdalclitch (Kate Maberly) who discover him. He is sold to a lady of the royal court, who presents him to the Queen of Brobdingnag (Alfre Woodard). He is examined by the doctors who ridicule him for his size, and discusses the politics of Brobdingnag, which are different from the traditional politics of the normal kingdom of England. He eventually gains the despise of the court dwarf Grildrig (Warwick Davis), who is envious of not being considered the "smallest man in the kingdom". The dwarf sends him some giant wasps to kill Gulliver, but Gulliver is swift enough to kill them. He then extracts a wasp's sting and makes a dagger from it. Meanwhile, Glumdalclitch eventually falls in love with Gulliver and wishes to marry him. Gulliver softly rejects her advances and asks her to free him. So, she took him to the Brobdingnag beaches where Gulliver searched for ships on the horizon. Sadly, there wasn't one to be seen. Glumdalclitch knows she'll missed Gulliver very much as he himself comforted her spirits. The wind was cold, and Gulliver requested Glumdalclitch to be put back in his box. She did, as Glumdalclitch gave him a loving kiss, and hug, puts Gulliver in, and left for a walk. Although, at one point, it subsequently gets snatched up into the air by a giant eagle! Gulliver sees the flying land of Laputa and signals them to pick him up. They do so and he immediately befriends the Rajah (Shashi Kapoor) and Prince Munodi (Navin Chowdhry) where Prince Munodi is considered an idiot. He converses with two astronomers and learns of the way to speak to them when they get into a thinking state. Gulliver later learns the tricks of these men and they share their knowledge of math and astronomy among other things. After getting ready for the "End of the World Ball," Gulliver participates in a battle in which the kingdom of the prince's mother Empress Munodi (Geraldine Chaplin) is attacked. Gulliver falls from the hole (which is under a magnet that sustains the island above the ground) into a bed under the palace. He then converses with Empress Munodi of the place called "the Academy," where he questions several English customs while looking for the Room of Answers (on how to get back to England). After leaving the Academy, he encounters a magician (Omar Sharif) in Glubbdubdrib and stays at his house with the promise of being taken to a port to go to England. While the days pass, Gulliver wonders when will this be as the magician only says his servants are looking for two horses that escaped and that they'll "go tomorrow." Gulliver later discovers the magician is drugging him and using his blood to summon the ghosts of great figures such as Alexander the Great (Ian Dunn) and Julius Caesar. Gulliver later summons more spirits by his own will. After summoning many spirits, he abandons the place realizing everything's an illusion when he goes through two standing guardians. He later meets the Struldbrugs where he gives his wasp-sting dagger to the Immortal Gatekeeper (Kristin Scott Thomas) to enter, later rejecting their offer to gain immortality by drinking their water (because it also causes blindness). Gulliver makes it to a port where the ship's captain agrees to take him back to England. Following an undepicted mutiny, due to plague aboard the ship, Gulliver arrives on the island of the Houyhnhnm horses (where he is enchanted by their intelligence and grace) and also encounters the Yahoos. Gulliver begins to get disgusted by the Yahoos and prefers the company of the Houyhnhnms. He talks to the Houyhnhnm Mistress (voiced by Isabelle Huppert) and explains his costumes and lifestyle, and begins to admire more their culture. After being attacked by Yahoos and saved by the Houyhnhnm Mistress, Gulliver begins to despise more and more the Yahoo lifestyle. He studies their customs and decides to prove the Houyhnhnms that he's more like them. He even rejects the diamonds he finds in a quarry. The Houyhnhnms, even though they recognize his virtues, form a council and decide that Gulliver must leave the island. With sadness, Gulliver then departs the island and is rescued by a Portuguese ship against his will. He then is in the moment amongst doctors in an evaluation. His wife is then asked if she believes his story. She answers that she believes in him and later questions Bates's motives to leave him in the institution. He answers he does it since it is his "Christian duty". She responds that his motives are "everything but Christian" and reveals his hideous plan of hiding the letters which had been discovered by Tom earlier in the film. After reassuring his tale once more, Gulliver's son enters the court room showing the small Lilliputian sheep Gulliver took care of. Gulliver is then released and he lives with his family. He still struggles to cope with them after receiving so much disgust of being a Yahoo, but has learned to be a better person and is dedicated to his new horses and family, whom he talks to again. It was mentioned by Lemuel in the narration that Dr. Bates wasn't seen again and it was said that he went abroad. The film ends in a scene of Gulliver and his family, whom he has grown to love once more, and shares what he is now as a person. The miniseries was generally well received by critics. Ken Tucker of Entertainment Weekly wrote that, "Everything about this production is surprising, from its choice of Gulliver—Cheers' Ted Danson in an excellent wig—to its startling fidelity to Jonathan Swift's 1726 novel," and called it "a big, gaudy, funny production that feels free to give full reign to Swift's blithe vulgarity." ^ Bacon, Matt (1997). No Strings Attached: The Inside Story of Jim Henson's Creature Shop. Macmillan. pp. 150–151. ISBN 0-02-862008-9. ^ Tucker, Ken (1996-02-02). "A Man for all Sizes". Entertainment Weekly. Retrieved 2008-06-25.